Atheneum Books for Young Readers, 9781442452947, 288pp. For Gabe, the equation for ideal summer bliss equals six glorious weeks of vigorous learning immersion at the Summer Center for Gifted Enrichment—aka, Nerd Camp. Last year was amazing, and this summer will be even better. At least, that’s what Gabe thinks until a new variable is introduced: Zack, Gabe’s cool stepbrother, was supposed to attend a camp nearby, but in the aftermath of a recent wildfire, Zack’s camp and nerd camp will be sharing territory. As these two very different worlds collide, will both camps—and both stepbrothers—survive the summer? "Elissa Brent Weissman has whipped up a clever, funny and moving story. Her characters consistently defy stereotype, revealing fascinating layers that make them feel startlingly real and relatable. Whether you're a science fiend, a jock or something in between, you'll love spending time at Nerd Camp." "This worthy sequel picks up almost a year after Nerd Camp (2011) left off.... Weissman’s dialogue is particularly entertaining in the back-and-forth between Gabe and his sweet and brainy bunkmates." 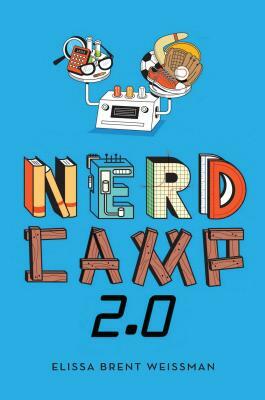 "For kids heading off to camp, Elissa Brent Weissman's laugh-out-loud tale of hijinks and sibling rivalry, Nerd Camp 2.0, earns its place in the duffle bag."